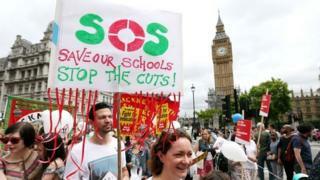 But last week Education Secretary Justine Greening promised to reallocate £1.3bn more for school budgets. About six in 10 multi-academy trusts spent more than their income - and just under half of standalone academies had an income shortfall. But the Department for Education says this "deficit does not mean that these academies or trusts are in debt, as they may have reserve funds through which these costs were met". The figures also show that the proportion of income spent by academies on teaching is lower than in 2011-12, while the proportion of spending on "back office" costs has risen. But the Department for Education cautions against direct comparisons, because the number of academies has changed across these years. And the department claims that academies could have collective reserves worth more than £2bn. Median per-pupil funding is presented as a more reliable measure over time. Most secondary schools are now academies - and the official figures show that at secondary school level income has fallen in cash terms - down by £626 per pupil. But in primary schools, income has risen by £78 per pupil over the four years, without any adjustment for inflation. The figures follow an announcement last week by the education secretary that school budgets would be protected in real terms, with £1.3bn more being put into school budgets over the next two years. This will not be new money, but will be taken from other budgets, including spending on free schools, school improvement support and "healthy pupils" capital funding. Ms Greening has promised that no school will lose out in cash terms from a new funding formula to be announced in the autumn. The reallocation of funding to frontline school budgets will prevent cuts in average budgets for two years. Rosamund McNeil, from the National Union of Teachers, said the latest funding figures showed "the growing financial crisis affecting all schools - academies as well as maintained". She said she was concerned that "academies' expenditure on teaching staff has fallen" and that it showed "academy status is no security against financial austerity". But a Department for Education spokesman said the new figures showed the efficiency of the academy system and how it was open to financial scrutiny. "The transparency we have introduced to school budgets allows parents, teachers and the wider public to ensure that money is being used to deliver the best outcomes for their pupils," he said. "Figures like these, coupled with the introduction of our National Funding Formula, will give us even greater oversight of how much money is going into schools and how it is being spent."